Happy Friday, and I just came across some cool pictures of Greg Jein’s beautiful K7 Space Station from the DS9 episode, Trials and Tribble-ations. Greg Jein is one of the greatest model makers of all time, and his passion for Star trek is equally as great. This was definitely a labor of love project, and it shows in all the details. I love Greg and so miss the days of working in his shop back when real models were used for movies!!! So here are some fun pics to start the weekend, and hope everyone has a great couple of days off!!! Thanks for reminding me of this great episode; now I wanna pull it out and watch it this weekend. I love the design of K7, and I love how carefully Greg Jein added more detail to it. I don’t see them right away but I’m sure there are some jokes hidden in there somewhere! I have always liked the K7 station design, and I even like the little “Spacematic” in the shuttle bay there. Greg Jein is awesome. As a person who has always been into model making, he’s one of my heroes. Yeah he always built fantastic models in zero time frames!!!! Trek Space Stations have always been interesting. Someday, I would love to see someone do artwork detailing the insides of Earth Spacedock and K7 to show that what we saw on TV and the Movies was only the tip of the iceburg. Beautiful! I love the shuttle bay. Thanks so much for sharing. The K-7 simple yet elegant desgin and Greg Jein’s did a fantastic job recreating it. I have admit that Troubles and Trails are two of my Favoirte Trek Episodes. Hey John, I know this is probably a long shot, but would you know what the names and registry numbers were for those three ship models to the left of the station (two Reliants and one Excelsior)? I will look into it,, they all had joke names on them like the USS Screaming Queen and so on..
…unless you can think of a closer match, Mark. I guess that would depend on when these pictures were taken. “Trials” was early season 5, “Call” was the finale. if only some intrepid filmmaker would make make a film cg free and do the effects the old fashioned way…it would be awesome. Go rent moon!!! the moon base and landscape work is all a combo of miniatures and CG enhancements,, It really shows, to me anyway that the best looking and most realistic VFX are a combo and not just one elemental style all on it’s own. Not to mention Moon is one of the best hard SF movies of the last two decades! Yeah I loved it and whoever the designer/ illustrator was, was a big fan of Ron Cobb’s!!! They had piles of those ships at Image G back in the day. They were used for BG ships in DS9. I also heard that this take on the K7 model was designed with the idea that each big round section was in fact a dock, or repair facility, that would open with the clamshell doors that make up the body or each pod. Inside would be various ships, docked, being loaded or repaired. This station always holds a warm place in my heart! Love to see these masterful models. Greg Jein is a model Michelangelo! I so concur and I would have loved to have seen the old original model,,, come to think of it I wonder what it’s fate was after the show????? Love the pics, thanks so much…As to its fate, it stands to reason to assume it is still in the possession of the studio. Why do I think so? I asked myself the same question about Jein’s Enterprise until she started to show up on the tour circuit in 2009 in the revamped Star Trek The Exhibition tour (I believe in the Hollywood & Highland Center , California for the first time)…. By the By, Doug mentioned on his blog that Greg Jein was busy writing a book about his work, anything you might know? I haven’t heard about that book but I’ll be seeing Greg soon for dinner so I’ll be sure to ask! PS the studio doesn’t have that model,, they sold everything and we have been in every warehouse that Paramount owned,, somebody has that model stored at their house or it got trashed long ago. Great pictures – thanks for posting these. K7 has always been one of my favorites. I love the detail in the hangar bay. that bay was so cool especially because of that inset lighting!!! 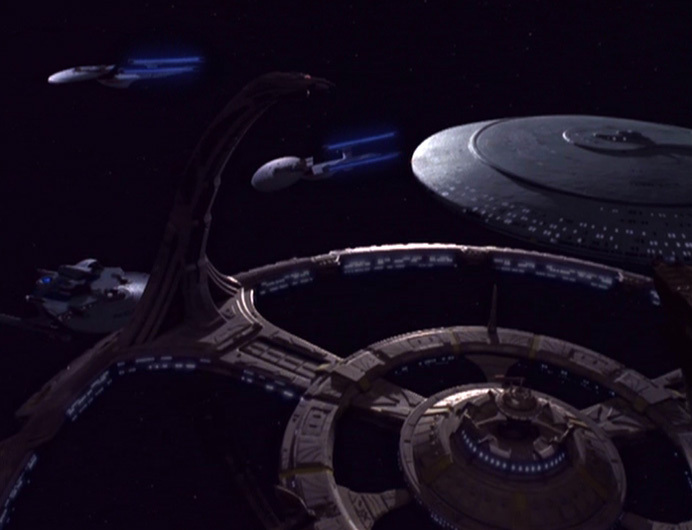 The Miranda-class starship seen in that screenshot from “The Way of the Warrior” was the U.S.S. Trial (NCC-1948). This starship’s name was revealed on the old official Star Trek site, and the ship’s registry was revealed in 2009 on Ex-Astris-Scientia. yes Ex astris has all the info on these tid bit ships!!! No sorry,,, been to busy at work to get anything else right now!!!! just something Greg conjured up I’m sure!!! Perhaps Cyrano Jones’ little smuggler…? Off topic- met one of your pin-up models at the Tucson Roller Derby; great lady who speaks highly of you!